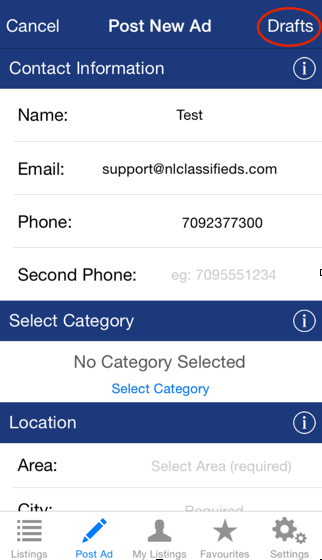 In this edition of App Feature Spotlight we'll explain another great aspect of the NL Classifieds App. Have you ever been in the middle of creating an ad and have to walk away? Well now you can save a draft and not lose any of your work. Hit the jump to learn more and start saving your own drafts! At any point while creating your ad within the NL Classifieds App, you have the option to scroll to the bottom and click "Save Draft". At any future time, when in the "Post Ad" section, you will be able to click "Drafts" in the top right corner and access all your saved listing drafts that you've begun. From here you will be able to pick up exactly where you left off. Load your draft and once satisfied with your completed ad, click "post listing" and let the magic begin. Please remember, with great power comes great responsibility! As always, you can reach us by phone at 709-237-7300 or at support@nlclassifieds.com with any questions, comments or concerns. NL Classifieds, Something For Everyone!